At recue-tec - your online-shop for firefighter gear and rescue service equipment you can buy the practical fire department / brigade backpacks for door opening tools or equipment for technical rescue. Useful fire and safety equipment for fire prevention is the backpack fire watch for fire picket or fire watching at festivals, celebrations, parties... 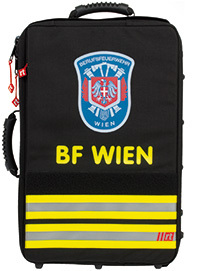 Meanwhile a range of bags and pouches especially for firefighting operations exits. You will also find PAX emergency backpacks for emergency squad. A rescue backpack has enough storage room for first aid material. Ideal helper for fire and rescue service. rescue-tec -the online shop for firefighter gear and equipment.